Lady Holland was one of the great Whig hostesses of the early nineteenth century. She was born Elizabeth Vassal, the daughter of a rich merchant family, and barely fifteen, she was forced to marry Sir Godfrey Webster, who was more than 20 years her senior. As can be expected she was deeply unhappy in her marriage, especially when Sir Godfrey became increasingly violent. It is no wonder then that Elizabeth tried to avoid the company of her husband as much as possible and travelled alone around the continent. In Italy she finally met Henry Richard Fox, 3rd Lord Holland and fell in love with him. Soon, she was pregnant with his child and her husband started divorce proceedings. The marriage was annulled in 1797, eight months after she had given birth to a son, Charles Fox Vassall -- and perhaps this was the revenge of Sir Godfrey: he went to parliament for an annulment so late that this child was born illegitimate and could not inherit Lord Holland's title! Two days after the annulment, Elizabeth married her Lord Holland. As you can well imagine, the divorce was the scandal of the year, and Lady Holland would never quite overcome the resulting damage to her reputation. Yet she did not pay any heed to the gossipmongers and instead managed to make Holland House in Kensington a glittering social, political and cultural centre. 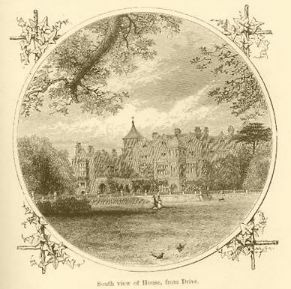 Regular guests to Holland House included Sir Walter Scott, Byron, who sent presentation copies of his works to Lady Holland; John Kemble, the famous actor; Henry Luttrell, one of the most famous wits of the Regency and a protegee of the Duchess of Devonshire; the lady-killer Palmerston, who was known as "Cupid" at Almack's, but more importantly was Secretary at War for nearly 20 years (1809-1830), Foreign Secretary for another twenty, and later Prime Minister under Queen Victoria; the Italian poet Ugo Foscolo and the Spanish-Irish poet José Maria Blanco White, who acted as tutor for Lord Holland's heir Henry for a while. And then, of course, there was John Allen, Lady Holland's very own Nubian slave, who lived at Holland House and combined the positions of librarian, steward and loyal friend. In The Lily Brand, when Troy's friend Drake tries to persuade him to go to a dinner at Holland House, he says, "Just look at it like that: if we have to attend one of these boring, boring dinner parties, we can at least go to the best London has to offer." The dinner parties at Holland House were certainly among the most eccentric London had to offer: the dinner table was always notoriously overcrowded, Lady Holland ordered her guests around as if they were servants, and she was famous for her brutal frankness.